NORTH BAY, Ont. 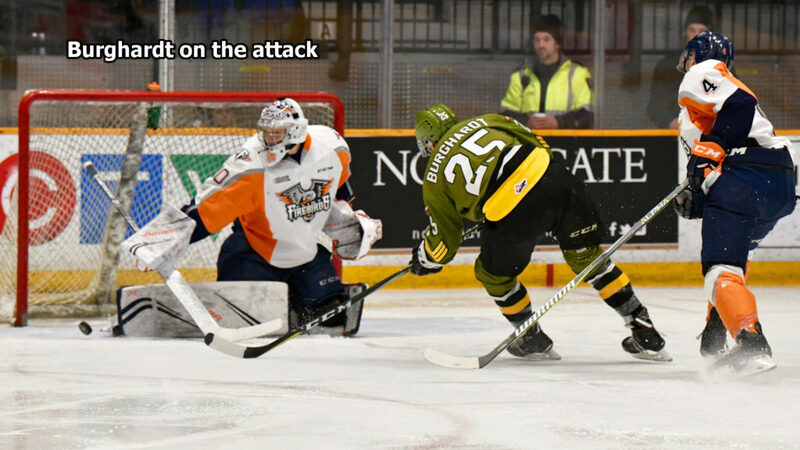 — Justin Brazeau scored his third goal at 3:36 of overtime to lift the North Bay Battalion to a 5-4 comeback victory Thursday night over the Flint Firebirds in Ontario Hockey League action. 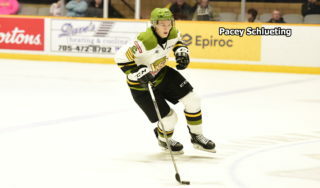 Brazeau, who also had an assist, scored North Bay’s third unanswered goal in the third period and overtime, his team-leading 48th of the season, as the Battalion ended a losing skid at three games and improved its won-lost-extended record to 24-24-4 for 52 points. 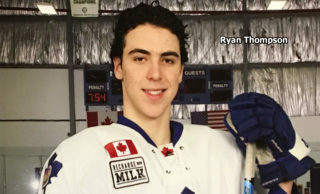 The Troops, fourth in the Central Division, climbed into sixth place in the Eastern Conference, one point ahead of the East Division’s Peterborough Petes and Hamilton Bulldogs. Luke Burghardt had one goal and three assists and Matthew Struthers one goal and one assist for the Battalion, while goaltender Christian Propp faced 31 shots before a crowd of 2,017. Nick King assisted on the last three goals. Ethan Keppen scored two goals and earned an assist for Flint, with Cody Morgan and Jack Wismer each contributing one goal and two assists. Goaltender Emanuel Vella made 35 saves as the Firebirds, 2-24-1 on the road, moved to 9-40-4 for 22 points, fifth in the West Division and last in the Western Conference and league. The Battalion was without coach Stan Butler, who was assessed a one-game suspension Thursday for interaction with a referee after a 5-4 overtime loss Sunday to the visiting Sarnia Sting. Assistant coaches Scott Wray and Adam Dennis ran the bench. “That’s a better team than their record,” Dennis said of the Firebirds, who dressed 17 skaters, one below the limit. The Troops trailed 4-2 after 40 minutes, but Brazeau struck at 4:25 of the third frame, beating Vella high to the glove side on a breakaway as Burghardt and King drew assists. Burghardt tied it with a power-play goal at 14:52, shoveling the puck into the net on assists by Brazeau and King. It was Burghardt’s sixth goal after a late start to the season because of a spinal issue. North Bay enjoyed a power play that went 1:24 into overtime before the teams got to skating three a side at 2:06. King did yeoman work on the left-wing boards to keep the puck in Flint territory, and Brad Chenier slipped it to the onrushing Brazeau, who snapped the disc home from the mid slot. It was his 17th career game-winning goal, one more than Ryan Oulahen and fourth in franchise annals. Wismer broke a 2-2 tie on the power play at 14:31 of the second period, converting the rebound of Morgan’s shot after Riley McCourt put the puck through traffic from the left point. It was Wismer’s 12th goal. Keppen capitalized at 19:18 after the Troops just failed to get the puck out of their zone. Morgan fed Wismer, who slid the puck toward the left side of the net only to have Keppen get his stick on it for his 22nd goal. Keppen opened the scoring at 3:40 of the first period, taking a back pass from Ty Dellandrea and sweeping the puck home from the mid slot, and Struthers responded at 8:11 off a two-on-one rush with Burghardt, who fed Struthers with a centring pass from the right wing for the conversion past Vella’s right pad. It was Struthers’s 23rd goal. Morgan scored at 14:04 after the puck was left unattended in the Battalion crease. 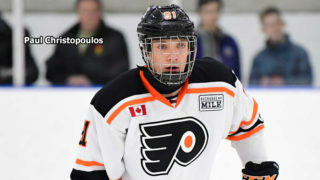 Morgan arrived to knock it over the goal line for his sixth goal on the season and his fourth since joining the Firebirds from the Windsor Spitfires. Wismer and Keppen were credited with assists. Brazeau tied it 49 seconds into the second period. Vella robbed Brazeau with the left pad before Struthers slipped the puck to North Bay’s offensive leader and he took it behind the net to the left circle, snapping it past the goaltender. 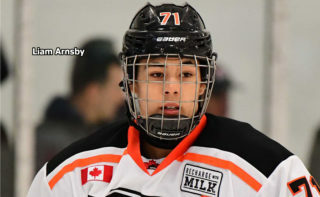 With 41 assists and 89 points in 52 games, Brazeau is second in the OHL scoring race to Tye Felhaber of the Ottawa 67’s, who has a league-leading 53 goals and 38 assists for 91 points in 52 games. The Battalion visits the Sudbury Wolves at 7:05 p.m. Wednesday. The game can be seen live in North Bay on YourTV Channels 12 and 700 and heard on Country 600 CKAT. 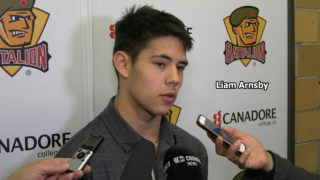 BATTALION BULLETS: It was CMHA Talk Today Night presented by Teachers Life in conjunction with the Canadian Mental Health Association’s Nipissing regional branch. Videos featured Battalion players talking about mental health, signs were available for fans to write messages and share them to social media, and the CMHA ran a kiosk in the concourse. The ceremonial puck drop was conducted by Shawn Walsh and Marcus Etienne … Attendance on a sleet-filled night was the lowest for a Battalion home game at Memorial Gardens. 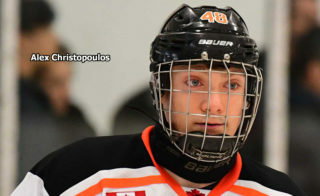 The previous low was 2,044 last Dec. 13 for an 8-5 win over the Kitchener Rangers … Butler engaged in a verbal exchange with referee Dan Ransom following the Sarnia game, in which the Troops led 4-2 late before phantom penalty calls against Harrison Caines and Luke Moncada. Sarnia scored on the two-man advantage before tying the game at even strength to precipitate overtime … Brazeau has 115 career goals, one more than Cody Hodgson and third on the franchise list. Brazeau is on a five-game points streak in which he has six goals and five assists for 11 points … The Battalion went 1-for-5 on the power play. Flint was 1-for-4 … Chenier returned to action after missing four games with a knee injury, while Daniel Walker was scratched with a sore shoulder. Travis Mailhot and Kurtis Evans also didn’t dress … McCourt has a six-game assists streak during which he has six assists.